In England and Wales, St Josephine Bakhita’s feast day is dedicated to prayer for victims of human trafficking and those who work to combat it. 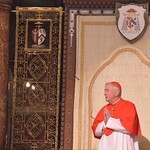 Cardinal Vincent, along with Sir Bernard Hogan-Howe, leads the Santa Marta Group to combat human trafficking worldwide. This is an alliance of international police chiefs and bishops from around the world working together with civil society in a process endorsed by Pope Francis who called it ‘an open wound on the body of contemporary society’, to eradicate human trafficking and modern day slavery. Within the diocese, Bakhita House, a project of Caritas Westminster, supports victims of human trafficking throughout their recovery, providing long-term and emergency support. In February 2015, the Westminster Record focused on the theme of human trafficking, including a piece on the Adoratrices, a religious community whose charism is to work with victims of this crime. It is available to read here. In the audio clip below, Year 7 students from Cardinal Pole School explain about the life of St Josephine Bakhita.